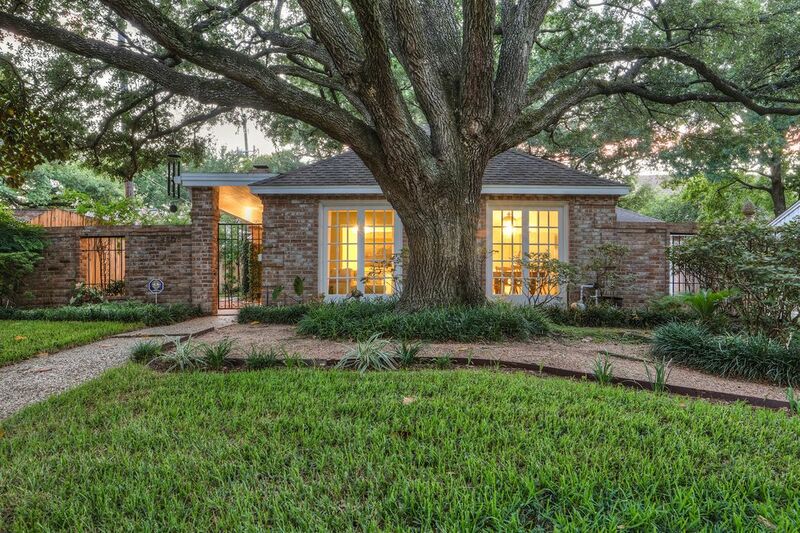 2606 Briarbrook Drive, Houston, TX 77042 | Martha Turner Sotheby's International Realty, Inc.
2606 Briarbrook is a lovely home with mature trees, brick and iron front fence and privacy fence on the sides. Home has 2 car attached garage. 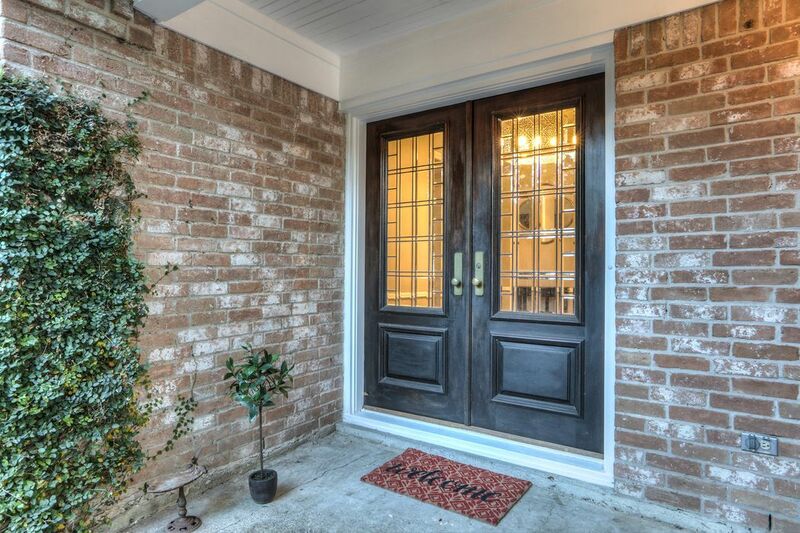 Beautiful covered front porch with double doors with raised glass panels. 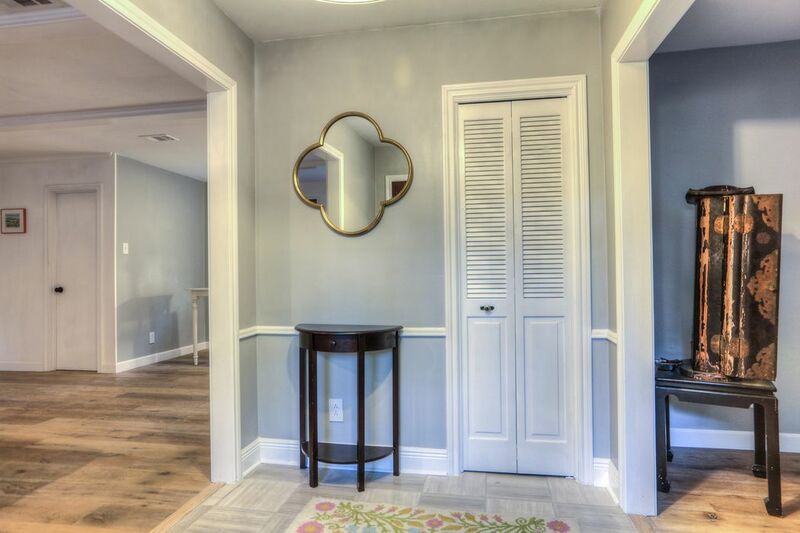 Step into the entry new tile flooring, chair rail molding and new fabric shade light. Entry also has hall closet with bi folding door. 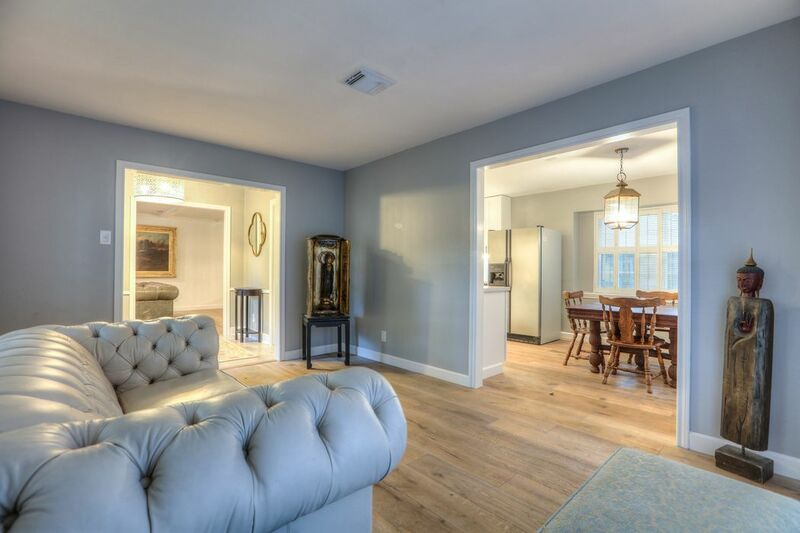 To the left is the family room and to the right is the formal living room. 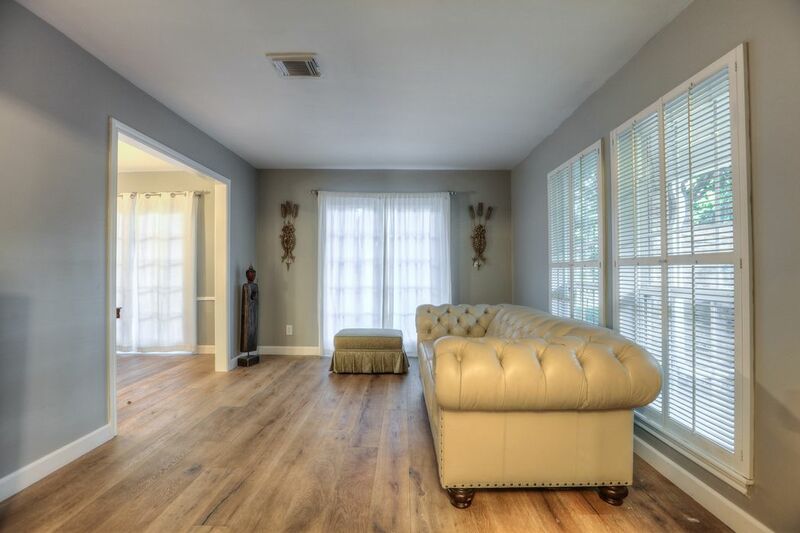 Formal living room is 16x10 and has new Pompeii European hand brushed wide plank Oak hardwood floors. 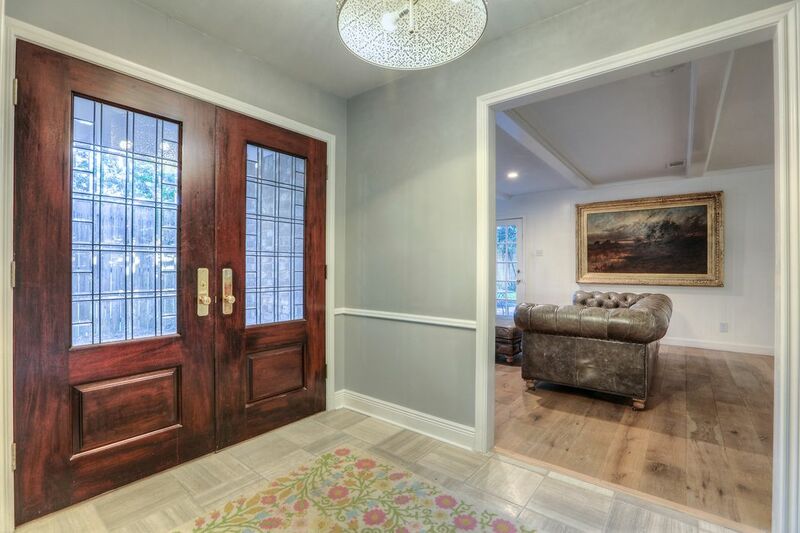 At the end of the living room are new floor to ceiling false doors overlooking front yard. Large windows have shutters. Living room has access to the dining room and kitchen. 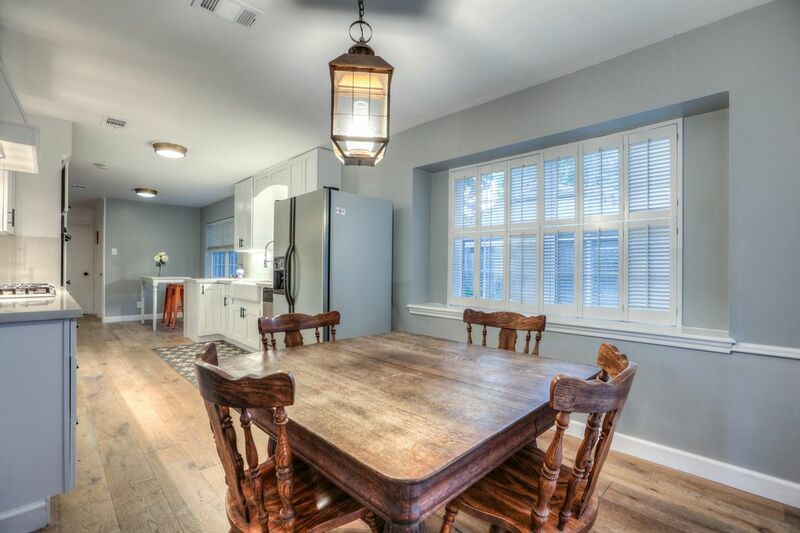 Large window with shutters, coach pendant light, chair rail molding and the new Pompeii European hand brushed wide plank Oak hardwood floors continue into the dining and kitchen. 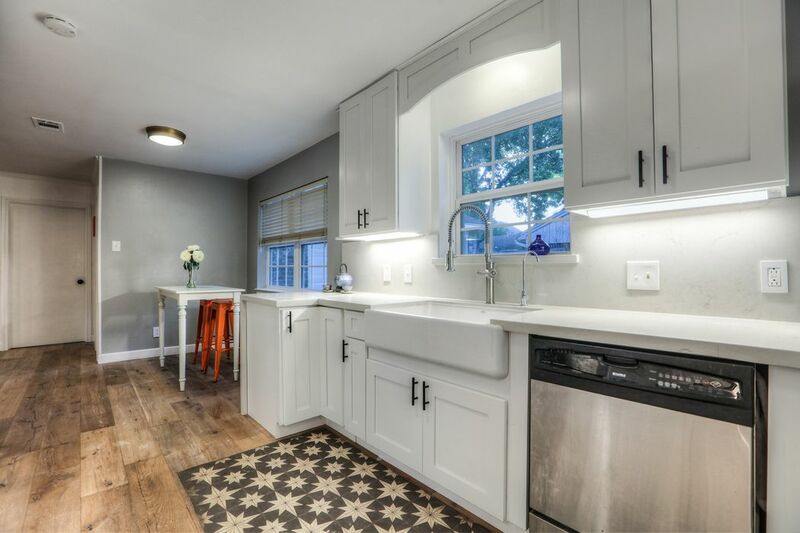 12x8 kitchen has farmhouse sink with chrome faucet with handheld sprayer, Carrara marble counter top with waterfall edge,Carrara marble back splash, modern style oil rubbed bronze pull handles and reach-in pantry. 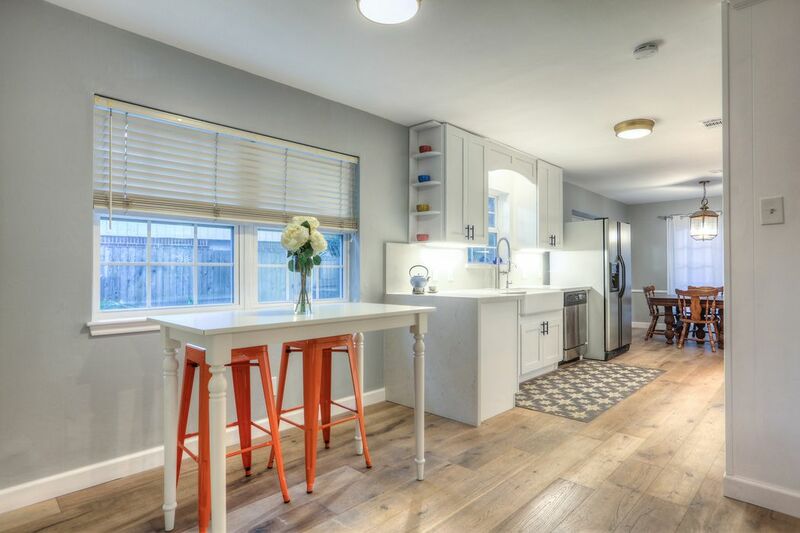 At the other end of the kitchen is the 9x8 breakfast room. Bronze dome light, 2" faux blinds and new Pompeii European hand brushed wide plank Oak hardwood floors. 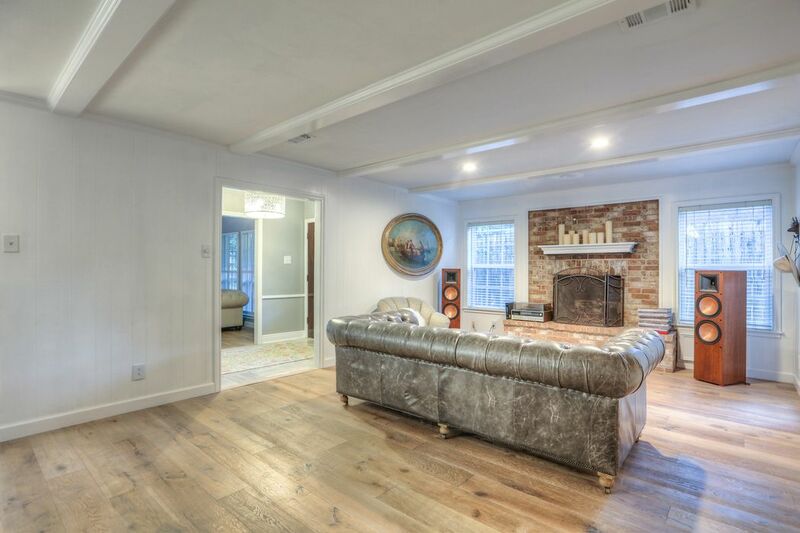 Gas log fireplace with brick hearth and wood mantle, wood beams and door to the side yard complete the family Room. 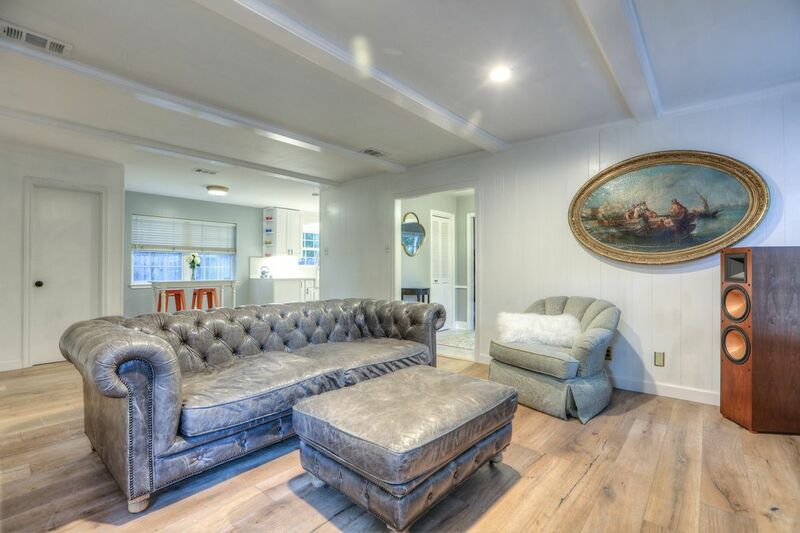 Family Room is 19x11. Recessed lighting, large windows overlooking side and backyard with 2" faux blinds. New Pompeii European hand brushed wide plank Oak hardwood floors continue. 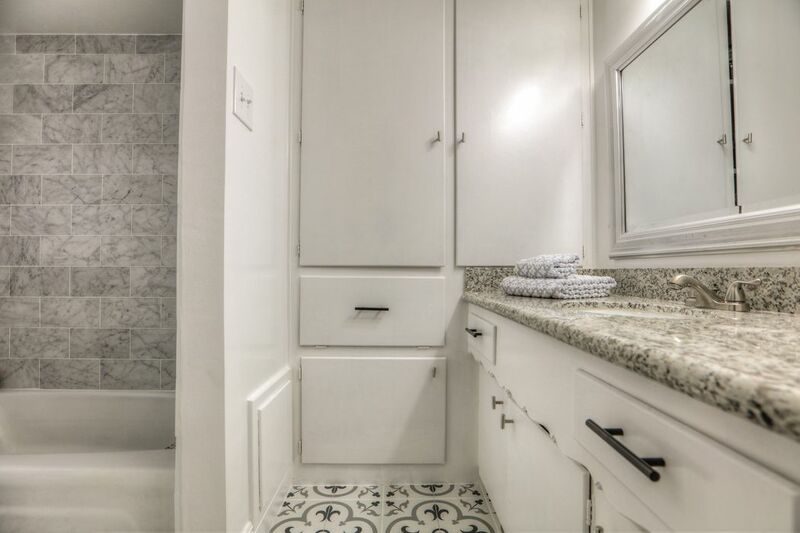 Door on the left leads to the powder room. 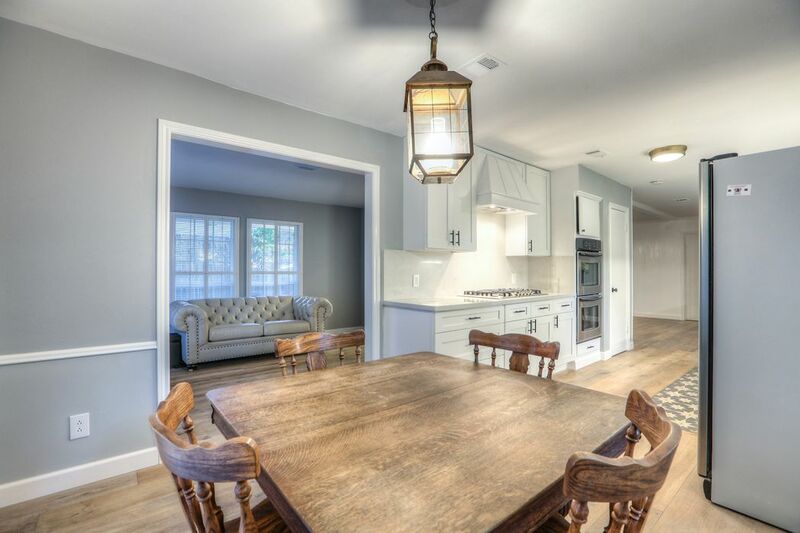 Great gathering space for family and friends. 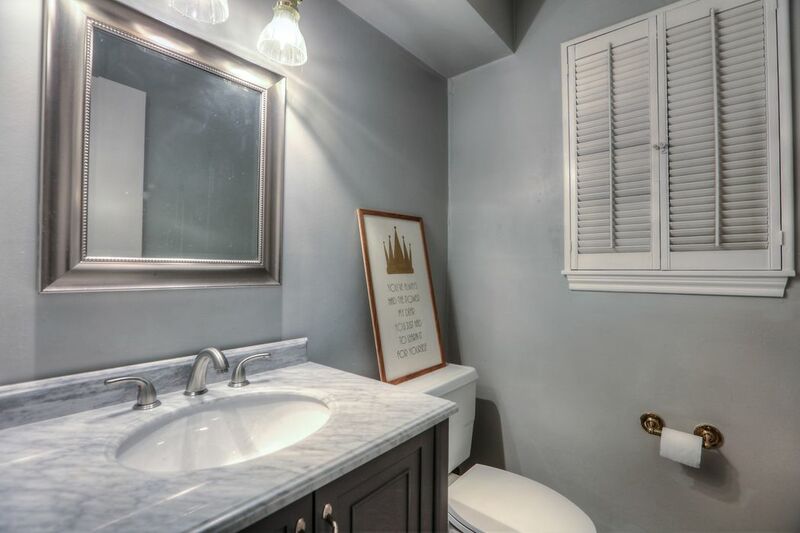 Powder room has new paint, Carrara marble counter top, furniture piece vanity, nickel faucet, 3 bulb vanity light, framed mirror, window shutters and black and grey designer tile flooring. 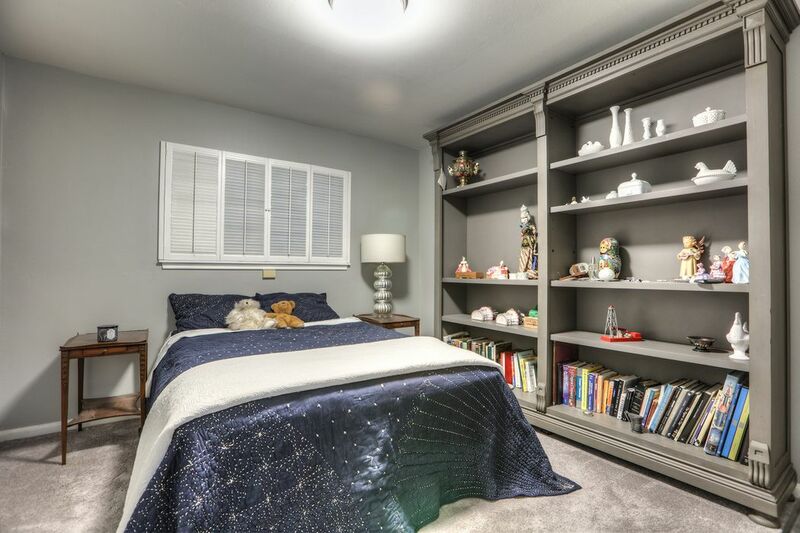 Master bedroom has dome light, window shutters, carpet and en-suite bathroom. 3 closets designed by ELFA. Room is 13x12. First of three secondary bedrooms is 12x10. 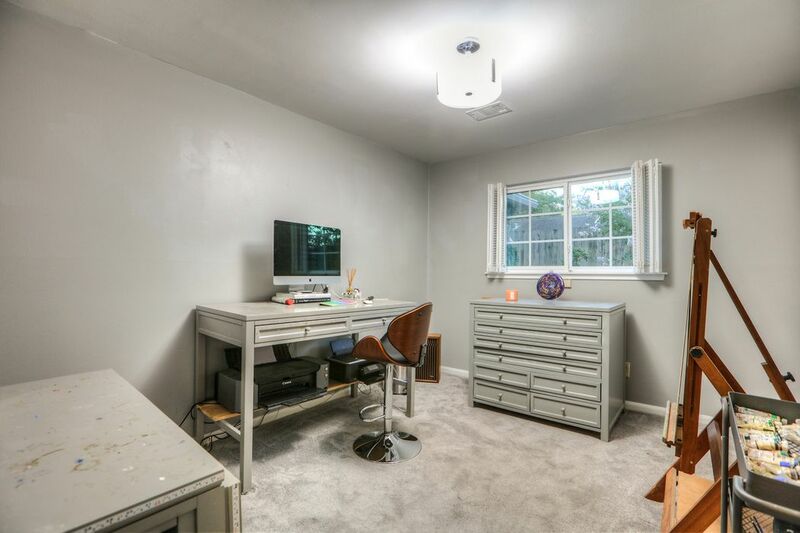 Dome light, window shutters, carpet and reach-in closet with bi fold doors. Secondary bedroom 3 is 11x11. 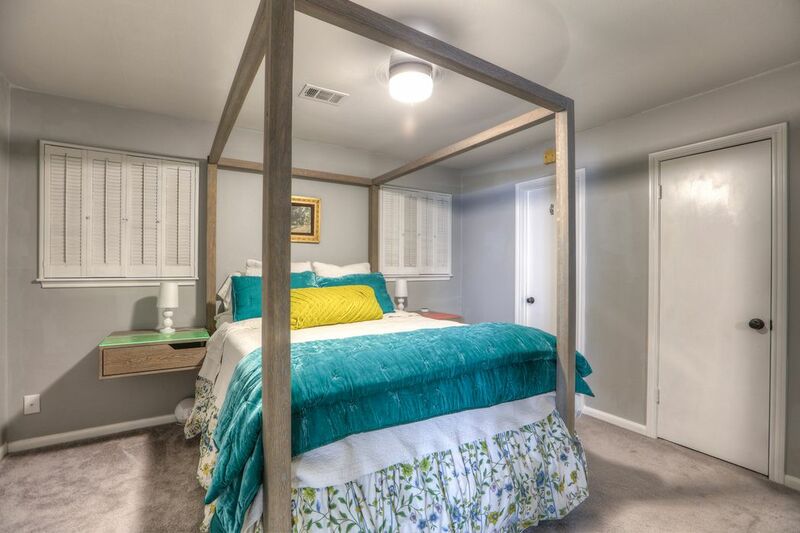 Fabric shade light, window shutters, carpet and walk-in closet. 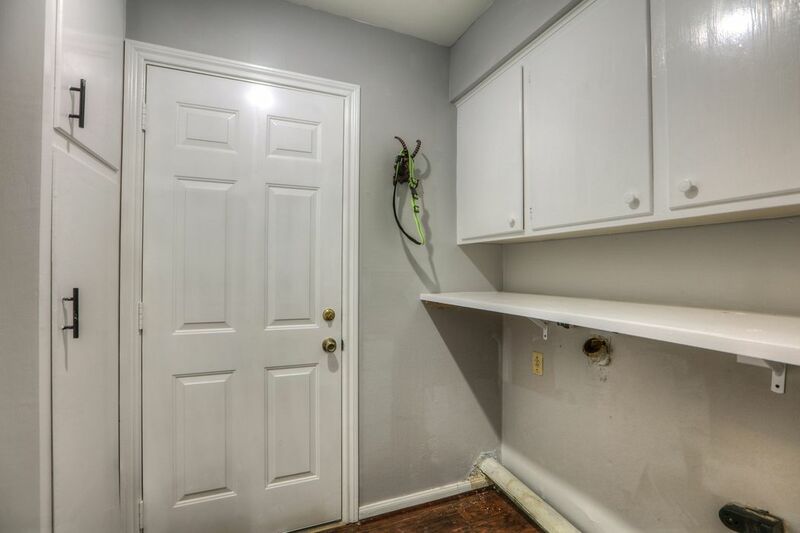 Utility room with built-in storage, folding table and gas and electric dryer connections. 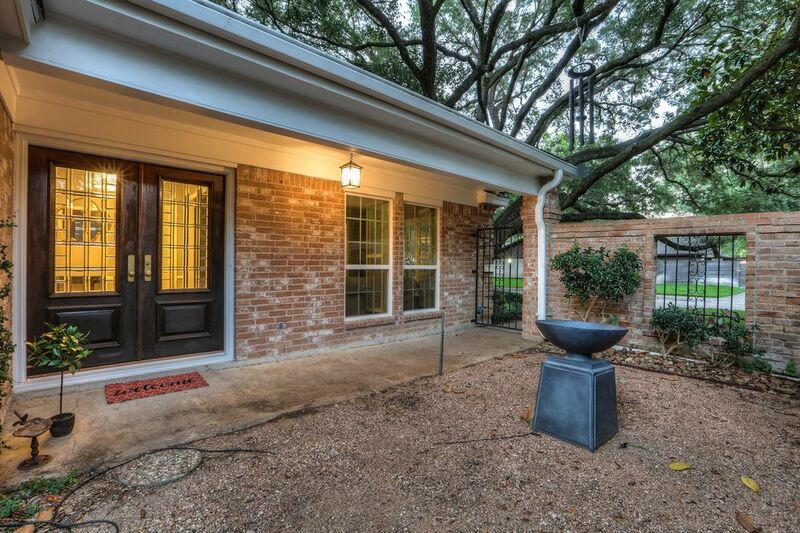 Front porch has coach pendant light and motion sensor lights. Entrance to the home is very welcoming. Entire house has new double pane windows. Side of house looking towards the front of the house and street. 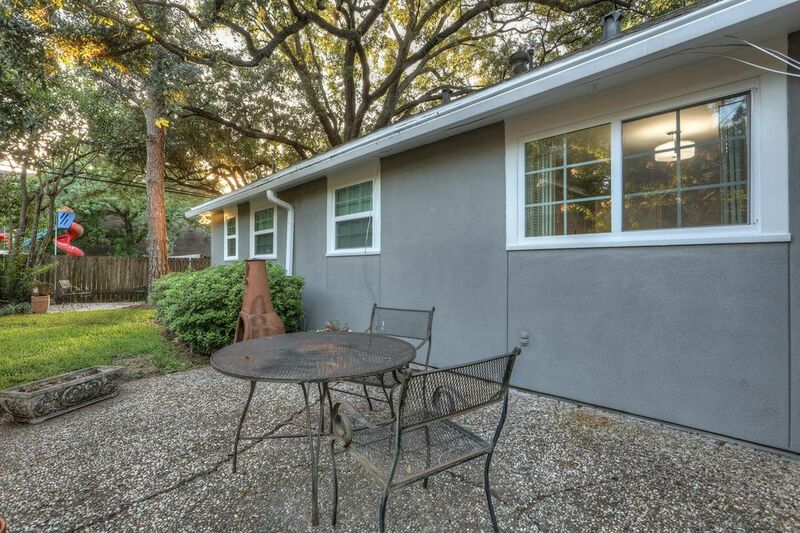 Cobblestone patio off of the back is the perfect place to sit and relax. 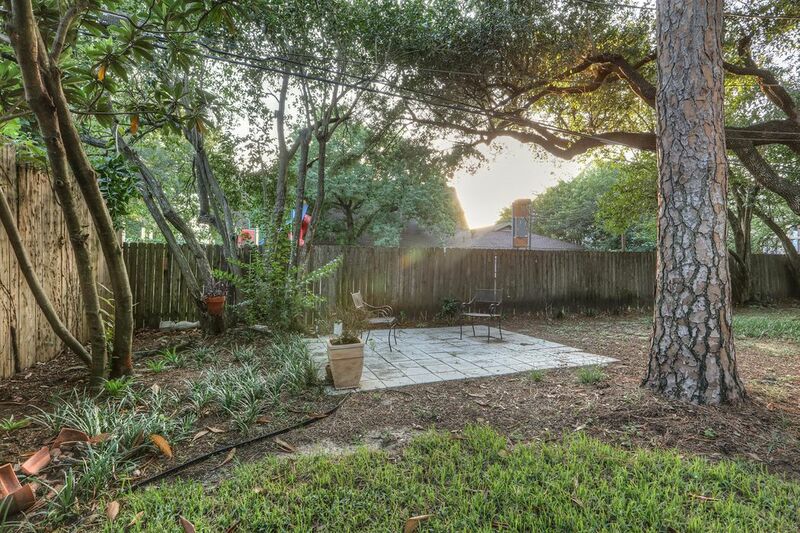 Another seating area in backyard by the mature trees. 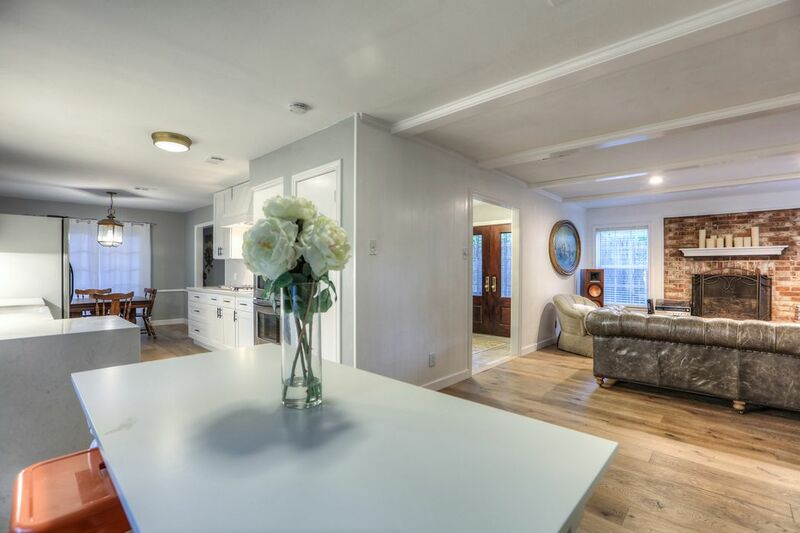 Lot is 8,906 sq ft.
Home has 2 car attached garage on the right and double wide driveway. 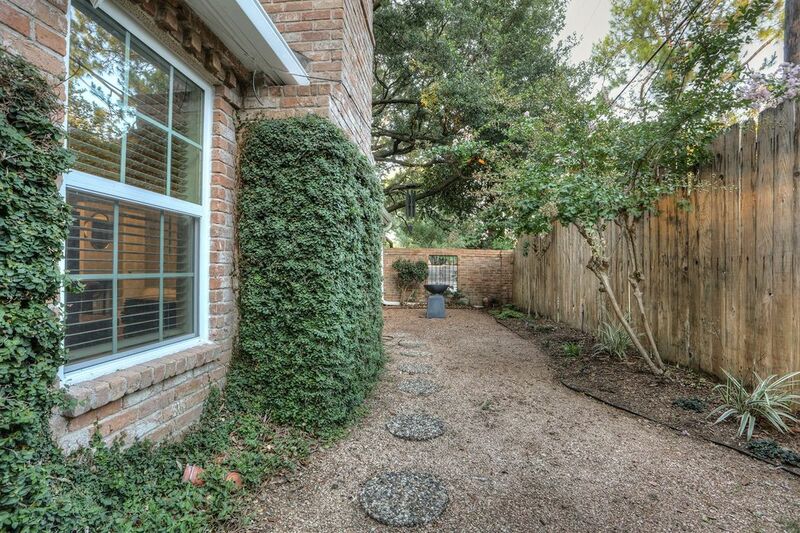 Cobblestone walkway takes you up to the front of the home. 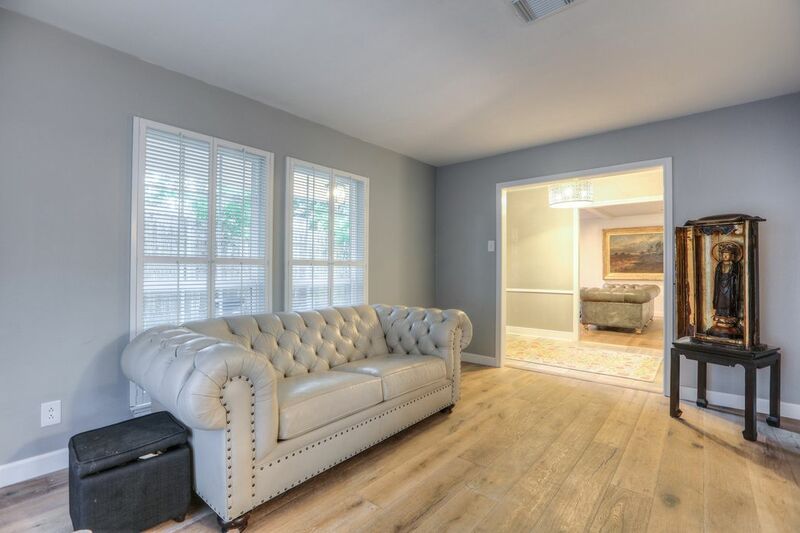 $449,000 4 Bedrooms2 Full / 1 Partial Baths1,913 sq. 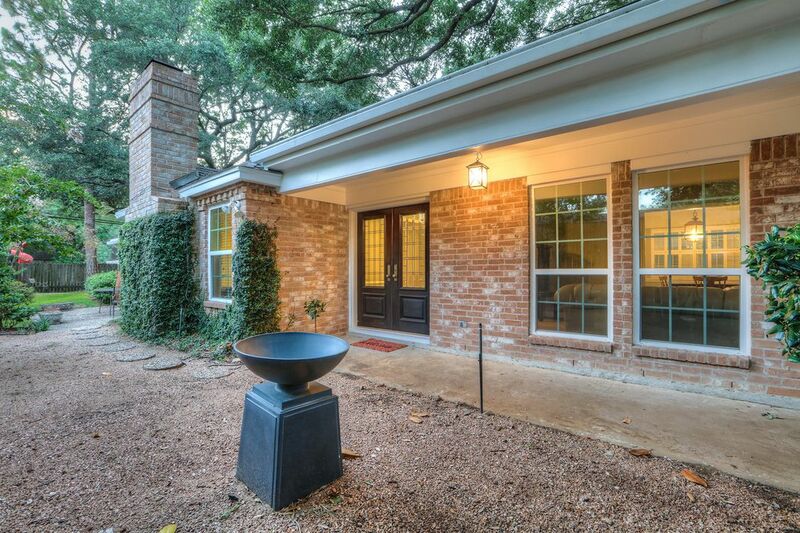 ft.
Charming home in Briargrove Park. 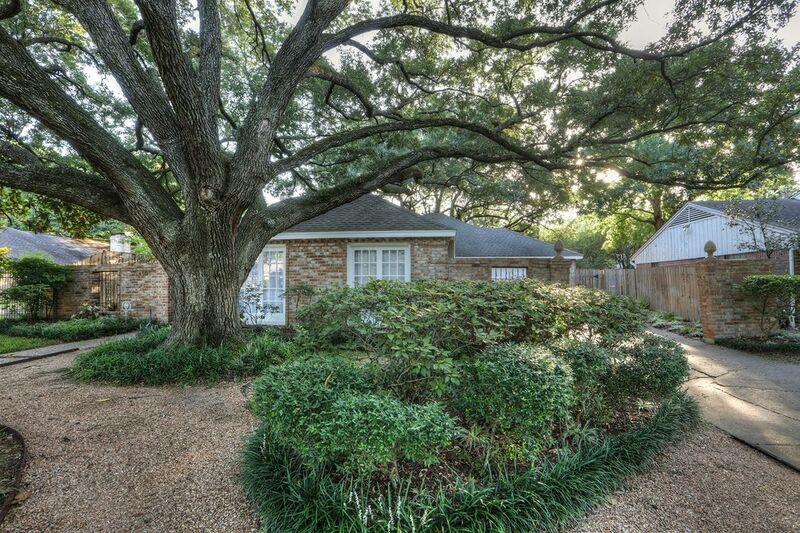 Nestled under large mature trees this one-story brick home has beauty and updates galore. 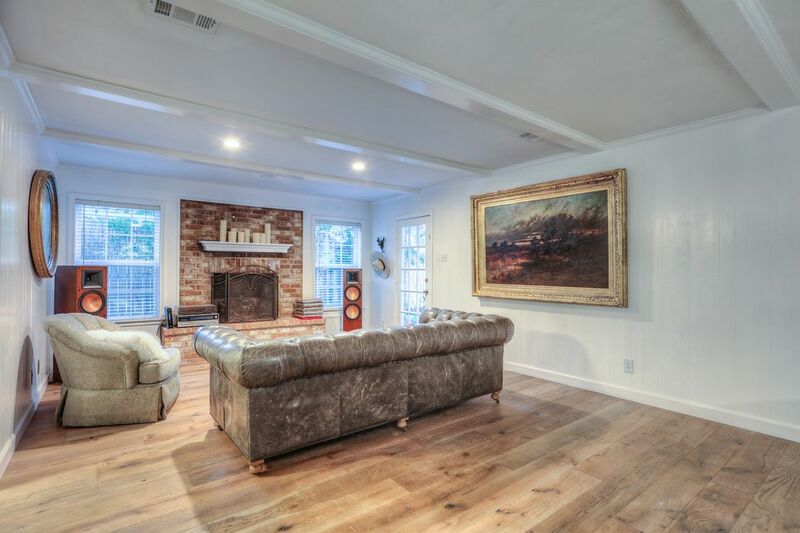 Formal living room, large windows, chair rail molding, new Pompeii European hand brushed wide plank oak hardwood floors, designer marble tile in all baths, gas log fireplace with brick hearth and wood beams. 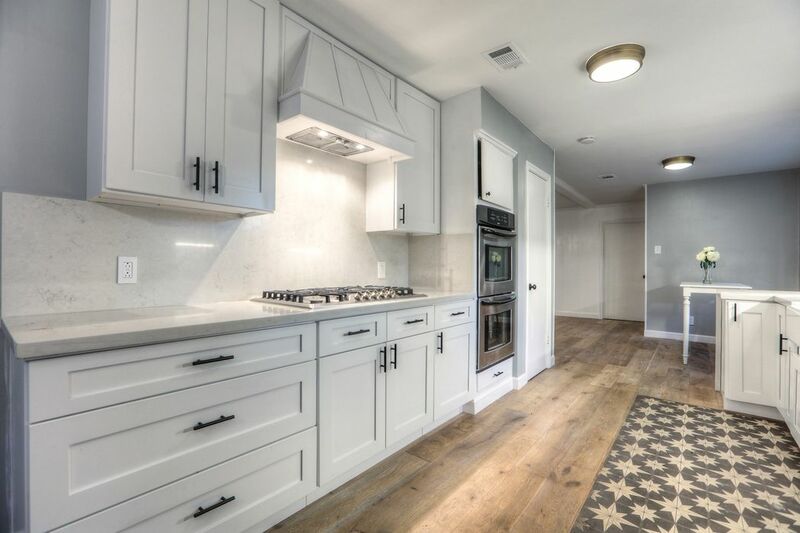 Newly updated kitchen with shaker-style cabinets, Carrara marble countertop with waterfall edge, stainless appliances, farmhouse sink and under cabinet lighting. 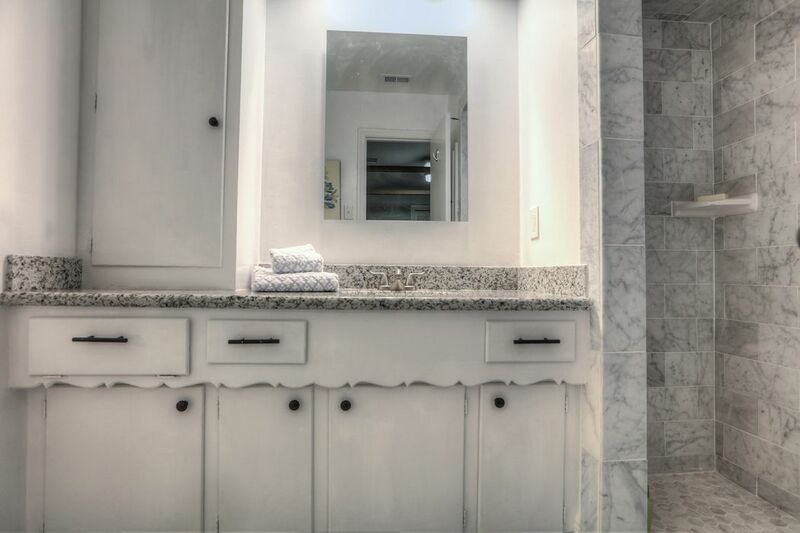 Master suite with three closets designed by ELFA, en suite bath and shower with floor-to-ceiling Carrara marble surround. 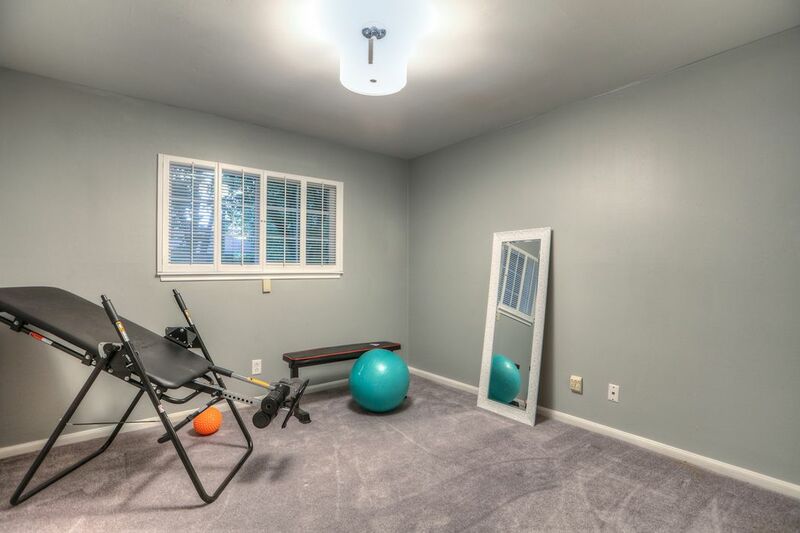 All bedrooms have carpet.